The Kitsap Sun editorial board met Tuesday with Flip Herndon, the new superintendent of Bremerton School District. Below are the video and live blog of the discussion. 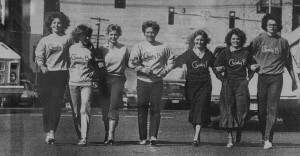 In the early 1980s, Bremerton child chic included acid-washed jeans, double slouched socks — and Charly B sweatshirts. It was Bremerton’s hometown brand during a time of brand-logo mania and when there were department stores and lots of people downtown. Local kids saved allowances and begged their parents for the shirts. An elementary school had a Charly B day. The shirts popped up in spots across the country, though they were sold only in Kitsap. Maybe it’s because some things from the ’80s (I said some) are trendy again. 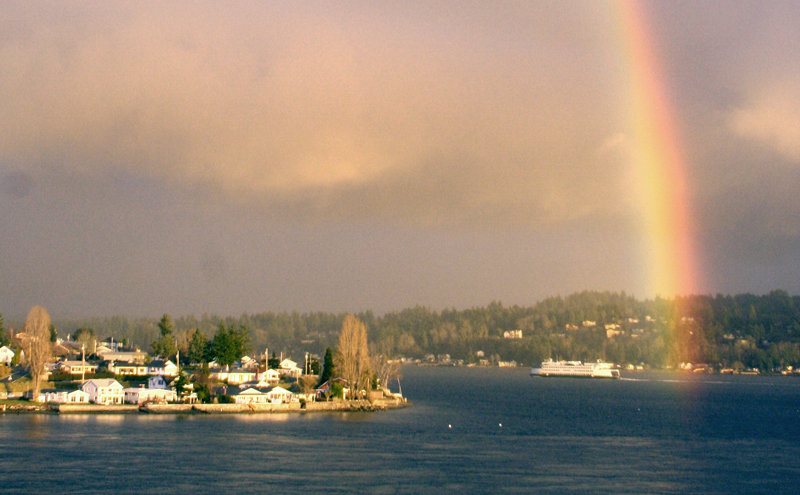 Maybe Bremerton pride is back. Or maybe its because those ’80s kids are old enough to be nostalgic. Whatever it is, Charly B shirts are back. A few shirts are appearing around town and being shipped off to former Kitsap residents across the country. They are the creation of longtime businessman Chuck Bair, who sold them first at a clothing store he owned with his wife, Patty, on Pacific Avenue, across from JC Penny — when there still was a JC Penny. Chuck had created the logo, a doodled script, for their retail store and eventually printed shirts that he sold there and later at stores in Redwood Plaza and the South Kitsap Mall. Nearly 70,000 shirts sold in the four years the Charly B clothing stores were open. But then the Kitsap Mall happened to downtown Bremerton. “We were one of the first ones to leave because we saw the writing on the wall,” Patty said. And they didn’t have the capital to open a store in the mall, Chuck said. 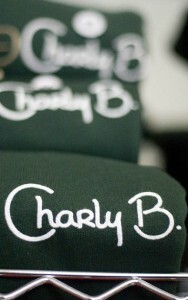 And with the Charly B stores went the Charly B shirts. Since that time, the couple focused on other businesses: their property management business; Patty ran franchise Baskin-Robbins ice cream stores; they briefly opened an Ivar’s in Redwood Plaza; and in 2006, they opened Kitsap Lake Storage. All the while, people kept asking about the shirts. They’d regale the couple with memories of their shirts, remembering even the color. So the Bairs started printing them again and as people asked for more, they printed more. They lined the shelves of an office room with shirts in multiple colors. They put out a sign in front of Kitsap Lake Storage, “and lo and behold it’s taken off again,” Chuck said. Some thanks for recent demand goes to online social networks. In April, the Bairs put up a web site to sell the shirts and post old photos and memories from customers. About 400 to 500 have sold. LeAnn Williams worked in the clothing stores as a young adult, and now works at the storage facility. “Who’d have thought 30 years later I’d be folding Charly B sweatshirts (again)?” she exclaimed. The shirts’ renewed success may not portend the return of Charly B clothing stores. Bremerton Beat: Redheads out there: are you offended? Apparently news of Bremerton’s revitalization projects are still making the rounds in the tourism magazine circuit. Enter the January 2009 edition of Sea Magazine. It’s a five-page splash with photos, factoids and a feature-length article. In break-out boxes, they highlight such fine dining restaurant experiences as Uptown Mike’s (don’t think there’s love lost there, they make a mighty fine New York Style hot dog and have Italian ice in the summer), and sights like the Naval Museum and Isella Day Spa. “Bremerton is blanketed with an energy that makes the hair on your arms stand up,” the article states. Now, being a born and raised Bremertonian, I have my own special love for the city, but I couldn’t help but think that the Port of Bremerton or the city paid for this glowing review. Well, I apparently should’ve put my snarky bit of skepticism (at least some of it) aside. I talked briefly with writer and Sea Magazine managing editor Brian Quines. Turns out, he’d heard about the new marina opening, was up here on a trip. “I’m from Orange County, so any time I can breathe fresh air it’s a good time,” he told me. But it apparently wasn’t just the light-headed giddiness of real oxygen sans smog. He spent a whole day here, got the grand tour and met with some good local folks. “Everyone’s just warm and refreshing up there,” he said. 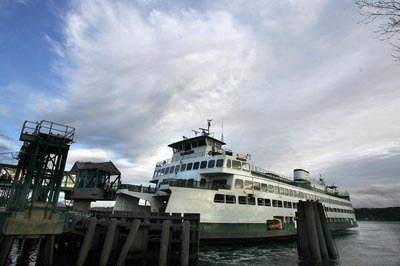 Ferries were only supposed to be a temporary fix when they were introduced in 1951, as officials started pushing for a bridge from Kitsap to the East side. In 1959, a plan that would have added a couple of bridges from South Kitsap at Fragaria over Vashon to someplace by Burien failed by one vote. It kept coming up year after year, especially when the state proposed a new Tacoma Narrows Bridge. Well, maybe that plan is out now. Through the years, letter-writers and even a former county commissioner have advocated a bridge from East Bremerton to South Bainbridge Island. Stan Stageberg of Poulsbo was a huge promoter of such a thing (to get traffic off of 305). The time may be finally be ripe for some enterprising, Seattle-loving group to start a petition for it. Throw in a commuter rail, and the overall commute would be reduced by 10 minutes. Ferry-lovers shouldn’t fret. This plan never had any political will, and never will. But here’s my semi-devious contention: if Islanders thought there was any true chance that Bremertonians could swarm Bainbridge via a 15-minute drive, just imagine the strings all those lawyers and rich property owners could pull to restore Bremerton ferry service (and thereby keep we Bremertonians off their Island).